Archibald Thomas Aird was the son of Archibald Small and Frances Aird. He was born about 1898. The family lived at Jasmine Lodge, Charlemont. His father was a retired tea planter. Archibald Aird attended the Royal School Dungannon, entering in 1913. He enlisted with the Irish Fusiliers in Newtownards. He was then sent to an officer’s cadet battalion in Bristol, England, before being gazetted 2nd Lieutenant in August 1917. Second Lieutenant Archibald Aird served with the 1st/18th Battalion of the London Regiment (London Irish Rifles), On 30th November 1917 the regimental diary records heavy shelling and casualties. 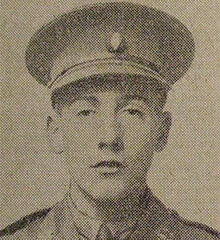 One of those casualties was Second Lieutenant Archibald Thomas Aird, who was killed in action on 30th November 1917.